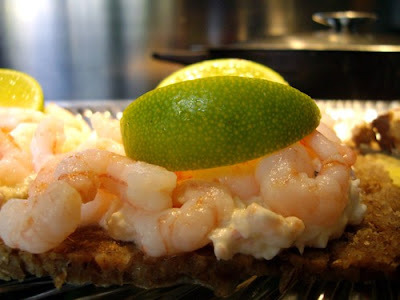 Open face sandwiches are eaten by Danes, Norwegian as well as the Swedes. The Danes are however the most faithful to this great tradition. Last Saturday I served two different sandwiches for lunch. I used Danish rye bread, two slices topped with Skagenrøre and peeled shrimps. 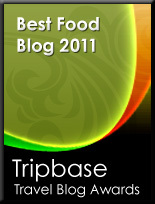 The other two had two large slices of Danish liver paté, garnished with cold fried slices of bacon and pickled cucumber. I am happy to say that open sandwiches are always a popular things to serve for lunch. The mere abundance of prawns and liverpaté, as one of my heroines the Danish Smørbrød Queen Ida Davidsen have stated. An open sandwich must have so much topping that you shall not see the slice of bread underneath. And what do you drink. We observed the tradition this Saturday. 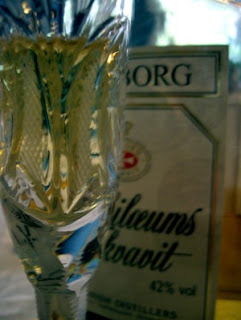 I had bought some bottles of Tuborg beer and the cold beer was followed by small Russian crystal glasses filled with the most delicious shots of Aalborg Jubilæums Akvavit. I was drowning in honey, sting less. I will not wait long to serve this delicious food for guests again. It was a success. 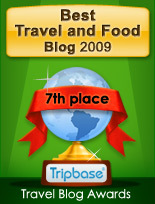 For those of you who want to learn more on Open Sandwiches you can read more here, and find some good recipes as well.